Another classic John Wayne movie arrives on DVD and features what the Duke is best doing... playing those classic Western heroes against all odds. 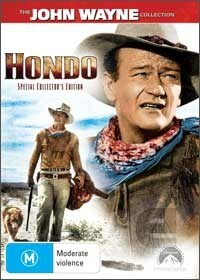 The story revolves around Hondo Lane, a cavalry rider who has been given the order to protect the headstrong Angie Lowe (Geraldine Page) who is fearfully awaiting the return of her husband (Leo Gordon). Angie refuses to leave the homestead, despite the fact the Apace war drums who soon falls for our hero in this classic Western adventure epic. What really sets this John Wayne DVD apart from others is the amazing special features that is everything you wanted to know about the behind the scenes of this movie and also John Wayne himself. Epic!